This week our blog is going to feature categories again, as I think they are a lot better. As a minister in the State of Chu – one of the seven warring states before Qin (221BC – 206BC) in China’s first feudal dynasty – Qu Yuan supported the decision to fight against the powerful State of Qin (one of the seven states during the Warring States Period (476 BC – 221 BC)) together with the State of Qi (ibid). However he was slandered by the aristocrat Zi Lan and was subsequently exiled by the King. In order to show his love and passion for his country, he wrote many enduring poems such as Li Sao (The Lament), Tian Wen (Asking Questions to the Heaven) and Jiu Ge (Nine Songs) and is therefore regarded as a famous poet in China’s history. 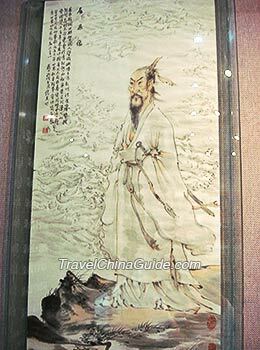 In 278 BC, after finishing his last masterpiece – Huai Sha (Embracing the Sand), he drowned himself in the river rather than see his country occupied and conquered by the State of Qin. On hearing of Qu Yuan’s death, the local people were in great distress. Fishermen searched for his body by sailing their boats down the river and other people threw food such as eggs and food like zongzi into the river to attract fish and other animals from destroying Qu Yuan’s body. Later, many people imitated these acts to show their respect for this great patriotic poet and this practice continues today. Because Qu Yuan died on the fifth day of the fifth lunar month, people decided to commemorate him on that day every year. For two thousand years, Qu Yuan’s patriotic spirit has influenced numerous people and he remains revered by the people from all over the world. Among the customs are dragon boat racing, eating zongzi (Vivian’s Mum made us some – THANKYOU), wearing a perfume pouch, tying five-colour silk thread and hanging mugwort leaves and calamus. We had a lovely dinner party with Cezary on Tuesday – MUM MADE PAVLOVA!!!!!! On Saturday, went swimming with Quinn & had dinner with Quinn – MUM MADE PAVLOVA AGAIN!!!!!! Only one more full week of school! P.S. WE HAVE JUST BOOKED FLIGHTS BACK TO ENGLAND IN JULY. P.P.S. PLEASE CAN WE HAVE SOME SUGGESTIONS ON WHERE TO GO IN BRITAIN THIS SUMMER? I still have one more week! Finishes on thursday. I think that A. Hannah would love to see you in France – Devon is quite a nice place to visit too! I suggest as the weather is so rubbish in England, that you come to France instead!! What an interesting legend. Wouldn’t we be better if we spent our time writing poems instead of stabbing and shooting? Looking forward to Mum’s perfected pavlova when you are back in UK. Apart from visiting your Granny you might like to look at http://www.treetoppers.com for your entertainment. ← Where has our fruit shop gone?